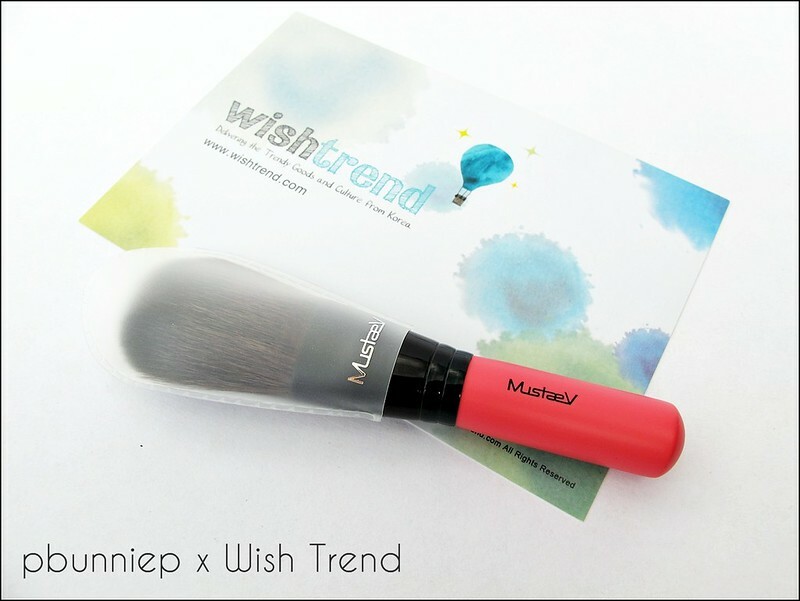 Today's post features my very first Korean makeup brush! Of all the Asian cosmetics and products I've used in the past, this is actually my first time trying a brush mostly because I haven't seen very many being sold online. But now that I finally have one in my hands, let's talk about it! 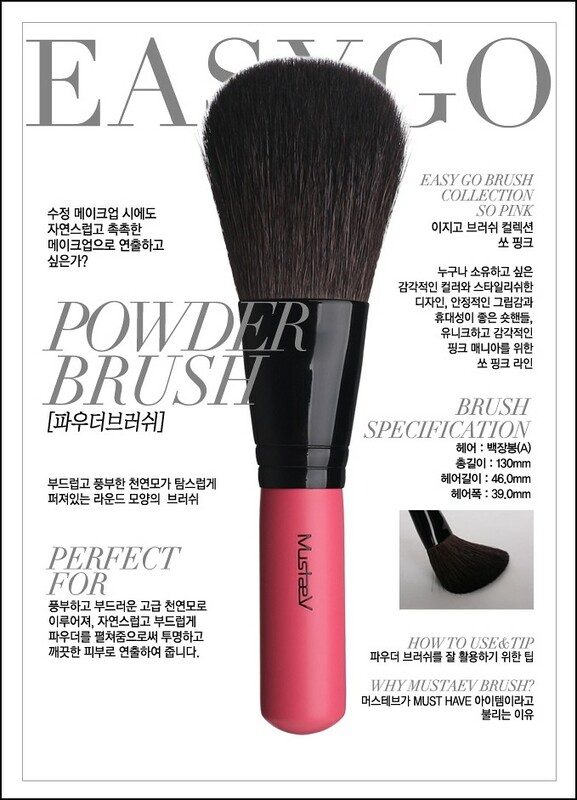 This is a travel size powder brush from Korean brand Mustaev, part of their Easy Go "So Pink" collection. 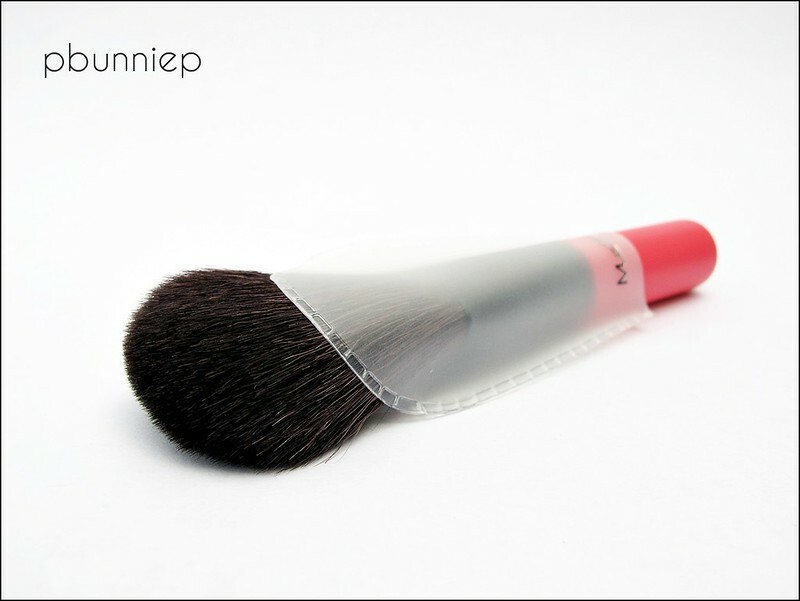 It features a full sized brush head on a shortened handle for easy storage into your makeup bag or brush roll without sacrificing on performance. Although I have seen Mustaev in various Korean beauty/style magazines such as Ceci, I've only just started to learn more about the brand myself. Below is a snap from their website which is incredibly well organized and modern looking, in fact the overall look reminds me a little of Bobbi Brown. 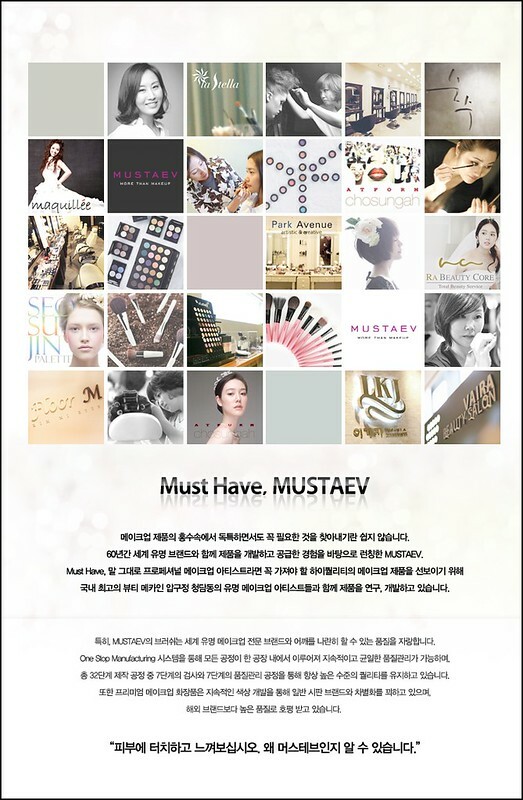 Mustaev has a very complete line of beauty products and from what I've read is considered a "makeup artist" brand in Korea (similar to MAC in that respect). This means not only are they loved by the people who know what they are doing but it also means that Mustaev continues to develop products that perform well on set, stage and makeup shoots. If you live in Korea, it seems that you can even order directly from their website online! On a side note, it may help to have google translator on when you are visiting the site. 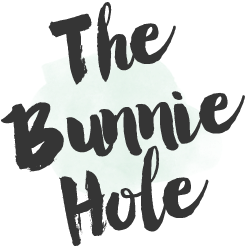 I was just clicking ALL the different tabs to see what came up and their range is quite impressive, especially the eyeshadows but more on that in a later post! A closer look at this powder brush. Material: Natural hair, metal furrule. Special features: Handcrafted. Comes in white, black and pink variation. Anti-bacterial treated! Let's start with the general feel of the brush, whilst it is a palm sized mini the brush doesn't skimp on quality and that's quite evident when you play with it in your hands. Mustaev brushes are all handmade and thus crafted with extreme care. Not only are the natural hairs lush and soft but the each hair is carefully placed to create the perfectly tapered shape. No stray hairs to be found and all the hairs naturally lay flat down even when I try to ruffle it up. And while I can't be certain what the handle is made of, altogether the brush has a good weight and although this is a travel brush, it's long enough to hold comfortably in my hand. 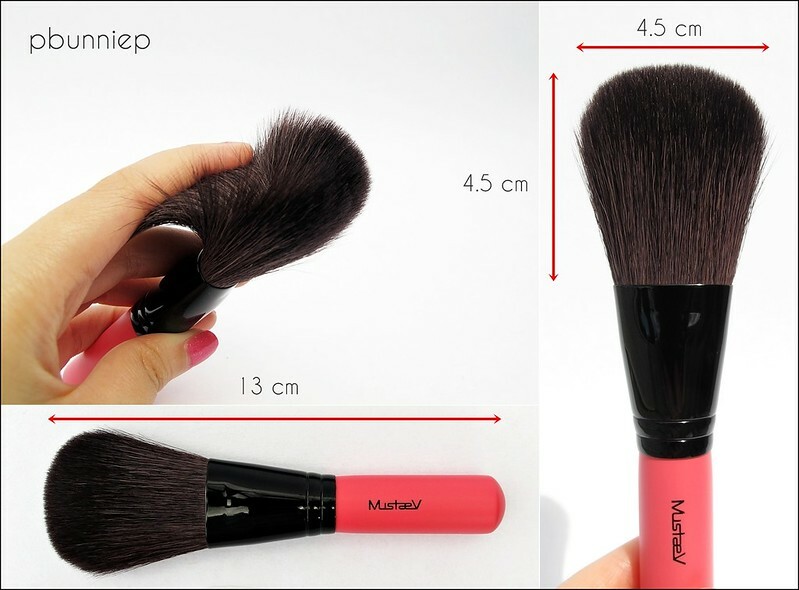 The shape of the brush and why you need it. If you are reading down to this point, you might be wondering why this "powder brush" has a tapered flat shape? When I first encountered makeup (and makeup books), it was widely taught that a powder brush should be big, round and fluffy. 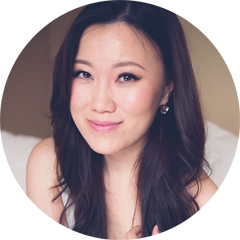 Yet as I read more about Asian makeup application (especially from watching makeup artist Jung Saem Mool on Youtube) I've noticed that many artists were using a flat shaped brush for a more precise powder application. It all made sense when I had this brush in my hands, the tapered shape allowed me to get close under the eyes to set my concealer and allowed me to powder specific areas of my face without disrupting areas where I wanted to keep clean. I liked the way that I can now sweep on my powder instead of dusting it on my face, in fact I might even consider retiring my big fluffy powder brush for other purposes! The first wash is often a big test for most makeup brushes, they come clean the tidy in the packaging but can sometimes turn into a mess once they hit water. I soaped up my Mustaev brush with baby shampoo as usual and swooshed in my palm for a good cleaning. It did shed a little colour as to be expected of most dark haired brushes I've used in the past but I'm very happy to say that not a hair was lost during the first wash and the bristles retained their shape and glossy shine. 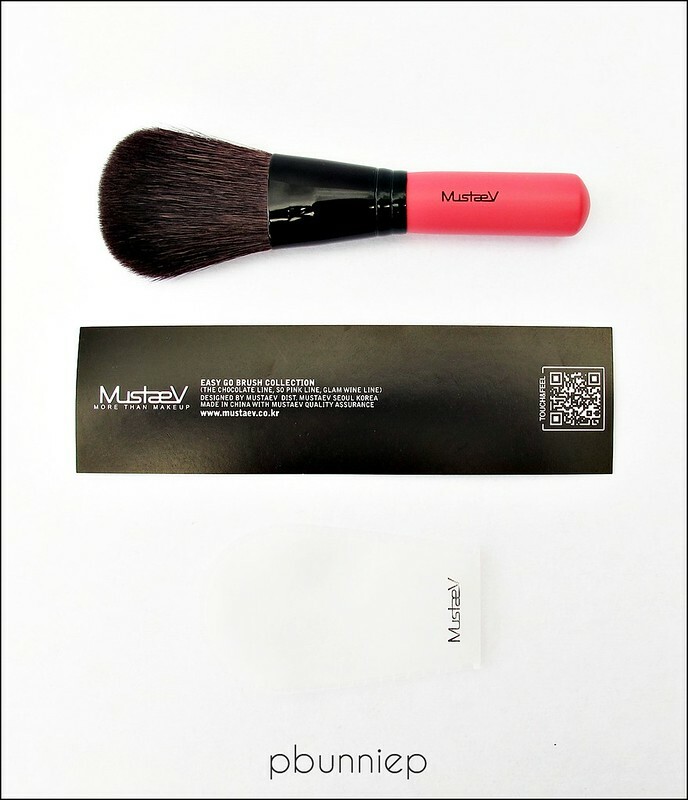 This brush can be found as part of Mustaev's travel set or can be purchased individually. 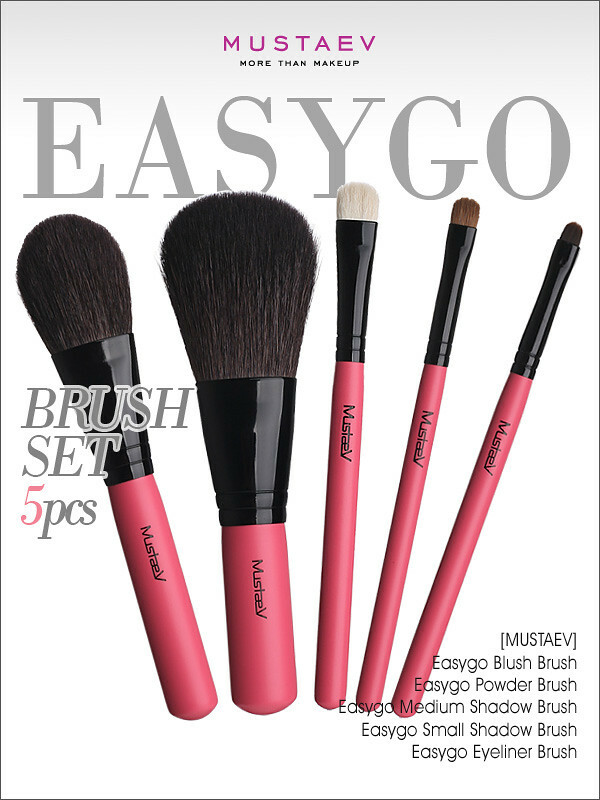 The travel set would be a great starter brush set for all your basic needs that you can keep at home or take on the go. It's also available in white, black and pink handles (Wishtrend carries the pink line). Find them below on Wishtrend! Now if I haven't said enough about the quality of Mustaev brushes, I'll also throw in a little extra. When I first received my brush in the package, I was pleasantly surprised to see that a thick brush guard was included (yes they come with every brush) which in all honesty MAC doesn't even do so. I hope this post was a good introduction to Mustaev's brand and of course their high quality makeup brushes. Go explore around their site and also see their products on Wishtrend (which is the only international site I've seen that carry Mustaev products). There's so many goodies you've yet to discover! Your reviews are so in-depth and comprehensive! Thanks! Mustaev makeup is not good quality in my opinion. It's expensive for a cheap quality product. I threw away everything I bought except for the eye shadows and brushes. They do not seem up to date in the makeup world as far as formulas. You could seriously buy better drugstore brand makeup.